McCall's Christmas Bazaar, McCall Pattern Co., 1978. Over 60 ideas for gifts and decorations include: Trim A Tree in Calico (Patchwork Eggs, Calico Rounds, christmas Stars, Yule Birds, Sachet Hearts, greeting cards, Sleigh Card Holder); What Comes Naturally (Dried Wildflower Candleholder, Wreath), Balsa Trims (Dried Flower Holder, Gift Box, Tree, Ornaments, Medallion), Covered Boxes with fabric and trim (Cigar Box, Coffee Can, Tea Tin, Large Cookie Tin, Small Cookie Tin); Ribbon Sewing Caddy, Silhouette Cards (Angel, Pear, Bells, Madonna), Desk Accessories covered with fabric (Open Folders, Folder With Flap, Small Folding Frame, Oval Mirror Frame, Bookends), Ribbon Bow Pouches (Rounded, Rectangular), Tassel- Decorated pouch, Bow- Trimmed Pillow, Rhinestone Pouch, Lace Lovelies Pillow or Sachet, Bandanna Covered Garden Set, Needlepoint Trims (Carollers, Santa, Candle in Wreath, Holly, Skating Mouse), Quilted Pot Holders and Cornucipia Mitts, Jiffy Pretzel Ideas (Candle Holders, Garlands), Pretzel Ornaments; Petite Planters made from hosery eggs, Child's Play Apron, Peppermint Tree, Butterfly Book Set Embroidered Bookmark and Book Jacket, Terry Bath Mitts, Strawberry Tree, Crochet Tricolor Pot Holders, Crochet Ombre Mittens & Scarf Set, Knit Flame Strope Mittens and Scarf Set, Crochet Vest & Tam, Crochet Vest & Scarf Set, Crochet Brother's Vest, Crochet Sister's Jumper, Knit Snowman Mittens, Knit Santa Mittens, Crochet 6 Frosted Baubles ball covers, Crochet Super Santa, Crocheted Train, Crocheted Quintet (Snowman, Santa, Soldier, Clown, Doll), Knit Patterned Stockings (Deer, Paper Dolls), Cookie Cutter Trims (cookie cutters attached together to create Star, Mobile, Garland, Gingerbread Man Tree), Pretzel Tree, Pretzel Wreath, Spearmint Rock Tree, Branch Gree, Hat Packages in fabric (Railroad Engineer's Hat Bag, Bowler Hat Bag, Red Felt Fedora Hat Bag, Baby Hat Bag, Ski Hat Bag), Knit Bootees with Doll, Sc Bootees with Chick, Knit Bootees with Bear. Very good used condition. 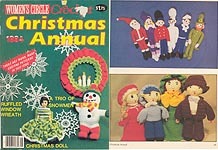 McCall's Christmas Knit & Crochet, 1979. 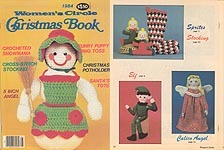 Projects include: KNIT Stockings, ornaments (including Peruvian Ornaments), Santa or Clown Mittens, Santa and Elf dolls; Large, Medium, and Small Santa and Mrs. Claus (35", 18", and 10"); Clown doll; Stuffed toys (puppy, 9 different toys made over styrofoam balls); 18" girl dolls; Kittens with Mittens; baby doll outfits in a variety of sizes; Mittens; Slippers,; Hat & Scarf Sets; Girls' Winter Playsuit: CROCHET Creche, Santa and Poinettia Afghans, 12 Days of Christmas Afghan, Stuffed dolls (Santa, Mrs. Santa, Reindeer, Snowman), several different stockings, Santa and Elf Stockings & Gift Totes, tree trims; stuffed animals (Lion, Kangaroo w/ Baby, Squirrel, Bears in several sizes, 3 Pigs & Wolf, puppies, kittens, rabbit, Tiger, Mouse Family); Horses and Sleighs with Riders; SchoolBus and Mail Truck; Five animal puppets; KNIT and CROCHET together Topsy Turvey dolls (Cinderella/ Fairy Godmother, Dorothy/ Lion, Goldilocks/ Bear, Alice. White Rabbit); Hanger covers, Slippers, Mittens; Hat & Scarf Sets -- and more! Great magazine in very good condition. 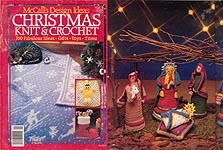 McCall's Christmas Knit & Crochet, Vol. 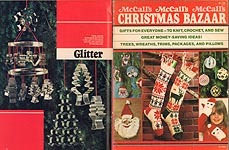 2, McCall's, 1980. 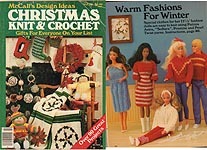 Projects include: Pom Pom Christmas Tree, Fabric Dolls with both KNIT and CROCHET outfits; KNIT Child's Vest and Tam Set, Set for 16" - 17" Dolls (Party Dress, Sweater, Pants), Lace Knit Cardigans for 22" Dolls, Ladybugs Girls' Pulllover Sweaters, Scandinavian Stockings for boy or girl, International Angels, Boy's Stocking with Train, Girl's stocking with figures, Candy Caddies (Santa, Elf, Rabbit, Duck, Rooster, Clown, Reindeer, Peppermint Holder), Santa doll, Tree, Reindeer, Wee Folk (Santa, Elves, Clown, Soldier, Leprechaun, Child's Hangers (Dog, Cat, Boy, Girl, Santa, Clown), Animal Mittens (Lion, Rabbit, Tiger, Cuckoo),Knitted Lion Family, Basset Hound, Easy Knit Hat, Easy Knit Scarf, Hooded Bunting, Child's Zip Up Jacket, Girl's Embroidered Jumper, Reindeer Muff, Child's Reindeer Pants Set; CROCHET Play Bolster, Aran Muff, Snowflake Stocking, Crib Blanket, Henry Hedgehog, Creche (Lamb, Cow, Donkey, Mary, Joseph, Manger, Angel, Shepherds, Wise Men) Embroidered afghan stitch Child's Norse Afghan, Goody Holders (Santa, Reindeer, Clown, Elf, Sheep), Tree Ornaments (Santa, Snowman, Star, Tree, Wreath, Angel), Snow Crystals (Starburst, Diamond, Christmas Star, Clover Leaf, Charmer, Snow Petals, Christmas Daisy, Rose Window, Front Crystal, Christmas Rose, Butterfly, Serenade, Georgiana), Little Angel Doll, Little Lady Doll, Pom Pon Ornaments (Santa, Elf, Reindeer, Tree), Package Trims (Wreath, Snowman, Angel, Deer, Sheep, Stocking, Santa), Poinsettia, Wreath), Christmas Bells, Simple Stockings, Pincushion Chair, Snowbaby Hanger, Santa Beanbag, Poinsettia Pot Holder, Santa Door Knob Cover, Santa Rattle, Dynamic Dragon, Royal Alligator, Princely Frog, Petey Puppy, Dina Dachshund, Fashion Doll Wardrobe (Bride's Gown and Crown, Bridesmaid's Dress and Hat set, Shell Stitch Tunic - Slacks - Cap Set, Pastel Beach Outfit with Top and Pants), Child's Vest and Scarf Set, Afghan Stitch Snowflake Sets (Cap and Mittens). Pages very age-yellowed and some are a bit fragile at seam, some back pages bent from storage. McCall's Design Ideas Vol. 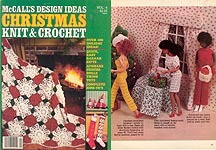 4: Christmas Knit & Crochet, McCall's, 1981. Projects include: KNIT North Pole Elves dolls, Stockings (Joy, Tree, Heart and Tree, Santa & Chimney, Tree & Reindeer, Snowflakes, Reindeer and Snowflakes), Snowman doll, Fashion Doll Outfits (Dress, Sweater & Pants, Robe, Cardigan, Slim Slacks, Hat, Pullover, Pants and matching Hat, Fisherman Knit Cardigans), Three Piece Snowsuit for baby doll, Baby Doll Cardigan, Golf Club Covers, Fisherman Knits (Cap, Mittens in two sizes, Slippers), Sporting Sweaters, Two-Layer Baby Coverlet/ Bunting, Baby Suit (pants & jacket), Freddy Frog, Katy Kat, The First Noel Nativity, Fabric Dolls with Knitted Outfits, Red Riding Hood, Grama, Wolf, Fisherman Cables child's Cap & MIttens, Snowflake child's Cap & Mittens, Baby Sweater & Cap Set, Pixie Poncho; CROCHET Merry Afghan, Caroler Dolls, Snowman Scene (Snowman and two children dolls), Christmas Tree Skirt, Santas in several sizes, Large & Small Granny Square Stockings, Snowbirds, 6 Flowered Satin Ball Covers, 5 Snowflakes, Creature Cushions (Caterpiller , Armadillo), Noel Afghan, Pocket Pals (Santa, Elf, Snowman, Bear, Boy 7 Girl), Cornicopias, Fintter Puppets (Panda Teddy, Pig, Mouse, Puppy, Reindeer, Snowman, Elephant, Santa, and Frog), Yarn Loop Dolls (Bear, Santa, Elf, & Lion), Blondie & Butch Dolls, Humpty Dumpty, Disk Doll, Mrty Mouse, Pinafore Pattie, "Barbie Fashion Review" (Shawl, Evening Gown, Shoulder Cape, Jumpsuit, Bateau- neck Dress, Vest/ Top and Pants, Lounging Pajamas), Baby Doll Jacket- Cap- Coverlet set, Holiday Pot Holders, Pensylvania Dutch Pot Holder, Snowflake Mitt, 3" tall Tiny Elves, Candy Caddies (Santa, Elves, Puppy, Lion), Dressed Up Animals (Gray Mouse, Brown Bear, Turquoise Rabbit, Panda), Loop Stitch Puppy, Puppets (Green Frog, Pink Elephant, Tan Lion, Yellow Duck), Fizzy Family (strange creatures), Very good condition. McCall's Design Ideas Vol. 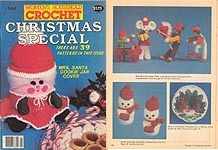 9: Christmas Knit & Crochet, McCall's, ca 1982. Projects include: KNIT Reversible Double- Knitted Winter Wonderland Afghan, 2 Snowman Stockings, 2 Santa Stockings, Tree Stocking, Reindeer Stocking, Crayon Classic Pullover, Layered Look Pull, Hooded Jacket, Hat- Scarf & Mittens, Beret & Mittens, Baby Blanket, Baby Booties, Doll in Stocking, First Christmas Stocking, Peasant Baby Set (embroidered bonnet, booties, Mittens, 14" - 15" Baby Doll Coat & Bonnet, Ribbed Cap & Scarf, Cap and Mitten Duo; CROCHET Poinsettias in the Snow afghan, Pot Holders, Six Pillows in thread, Large and Small Elves, Santa, Christmas Quintet (Santa, Mrs. Santa, Reindeer, Snowman and Woman), Toys on the Square (Pig, Lion, Panda, Dog), Toys in the Round (Bubbles the Clown, Sammy Snowman, Monsieur Le Gendarme, Santa), Mr. Snowman, Little Ornaments (Angel, Tree, Bell, Stocking, Wreath), Christmas Boot, Tree Skirt, Santa's Head, Tree Stocking, Santa Stocking, Doll Puppets, White Angel, Finger Puppet Trims (with bead heads), Toy Finger Puppets, Tasseled Bag, Mother & Daugher Pie Crust Tams/ Scarves, Child's Helmet and Muff, Blanket Baby Hand Puppets, Mother Goose Dolls (Little Miss Muffet, Jack Be Nimble, Mary Quite Contrary, Little Boy Blue, Three Men in a Tub, Little Jack Horner, Jack and Jill), Pillow- Burger, Crochet Turtle Pillow, Boy and Girl Elephants, Folk Art Creche, Angel of Peace, Lacy Angel Trims, 44 Snowflake Tree Crystals, 16" 18" Baby Doll Bunting, Sebastian Serpent, Speedy the Turtle, Jocko the Monkey pillow. Very good condition. McCall's Design Ideas Vol. 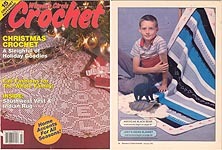 14: Christmas Knit & Crochet, McCall's, ca 1983. 130 Projects include: KNIT a variety of Stockings, 12" tall Brother & Sister Dolls, 22: annette doll, Animal toys (lamb, piglet, mama & baby Rabbits, Basset, 2 Cats, Bear, Polar Ber, Panda), 3 Bear Sweaters for Tots, several Children's Sweaters, Baby Bunting & Blanket, Child's Coverall set, Child's Hats, Mittens, & Gloves, Saddle Shoe Slippers, Knit Baby Sport Shoes, Baby's Aran Outfit; Jacquard Carriage Blanket & Pillow, Holiday Partridge / Pear Tree Quilt, 6 "Wee Knit Folk" ornaments; CROCHET Animals (Dog, Pig, Mother & Daughter Bunnies, Giraffe, Camel, Spider, Centipede, Dachshund, Alligator), Tennis Shoe Slippers, Sport Booties (Roller Skate, Golf Shoe, and Jogging Shoe), "Roly- Polies" (Spider, Dog, Mouse, Elephant, and Frog), "Susan" doll, Creche, Poinsettia and Tree afghan- stitch Tree Skirts, a variety of stockings, Snowmen dolls, Wreath/ Snowman/ Tree afghan, 8 Lacy Tree Trims, 5 tatted ball covers, Heads- up Pillows (Santa, Elf, Boy, and Clown), 4 Tote Bags; "Jacquard" Child's Afghan, 10 Ring Tree Ornaments; KNIT / CROCHET "Tummy Ticklers" finger puppets (Cat, Dog, Panda, Bear), Hat & Scarf Sets; and probably more that I missed! Great magazine in very good condition. McCall's Design Ideas Vol. 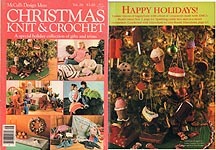 22: Christmas Knit & Crochet, McCall's, 1985. Projects include: KNIT Baby Doll Clothes for 16" - 18" soft sculpture dolls (Striped Set with Pullover - hat- pants; Dress, Fisherman Sweater- hat- pants set), Child's Fair Isle Cardigan Set with Hat & Mittens, Girl's Appliqued Posies Pullover, Rocking Horse Ornament, Christmas Tree Ornament, Teddy Bear Ornament, Bell Ornament, Stencilled Angel Stocking, Fair Isle Stocking, Cabled Stocking, Braided Tubes Wreath, Braided Hat & Scarf, Shawl, Hat - Cowl- Gloves Set, Striped Socks, LAcy Socks, Socks with Trees, Slip Stitch Socks, Bright Lighs Pullover, Bright Stripes Sweater, Sock & Tie Set, Men's Plaid Set (Hat, Scarf, Mittens), Man's Houndstooth Vest, Child's Fair Isle Helmet, Giraffe Set (Scarf, Hat, & Mittens), Fair Isle Baby Blanket, Baby's First Stocking, Baby's Mitten Ornament, Bib & Booties Sets (Cable, Two Color, Pink Hearts), Gingerbread CardHolder, Dog Sweater, Cat Stocking, Fashion Doll Outfits (Evening Ensemble, Chevron Pullover, Striped Pullover, Striped Dress, Fisherman Pullover; CROCHET Advent Calendar, Cat Basket Cover, Dog Stocking, Fish Toy, Ball (dog or cat toy), Child's Aviator Helmet, Doggie Set (Child's Scarf, Hat, & Mittens), Fabric Strip Log Carrier, Plaid Portable Lap Robe, Shawl, Beret- Cowl- Gloves Set, Cat Rug, Baby Doll Clothes for 16" - 18" soft sculpture dolls (Fisherman Set with sweater, hat, & pants, Textured Pullover with hat and pants), Child's Stenciled Lamb Pullover, Child's Pinafore, Victorian Christmas (Heart Ornament, Basket Ornament, Ball Ornament, Heart Sachet Ornament, Rose Petal Ball, Wreath Ornament, Filet Crochet Tree Top, Filet Rose Medallion, Round Sachet Ornament, Fan Ornament, Doily Nosegay Ornament), Country Christmas (Stencilled Placemats, Runner, Hot Mat, Casserole Mitt), Penguin Stocking, Tablecloth, Sprial Crochet Christmas Tree, Loop Stitch Wreath (using ribbon); SEW/ CROCHET Victorian Tree Skirt, Velvet Stocking, Appliqued Afghan & Tree Skirt, Appliqued Ornaments (Holly, Poinsettia) and probably more that I missed! Good used condition -- some wear and tear, but no stains or markings. McCall's Design Ideas Vol. 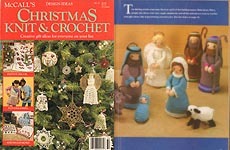 28: Christmas Knit & Crochet, McCall's, 1987. 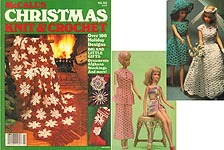 Projects include: KNIT Fashion Doll Clothes (Golden Slacks, Two- Piece Gown, Cowl- Neck Dress, Red & Gold Jacket - Camisole - Skirt Ensemble, Abstract Mini Dress), Texture Tie, Stripe Tie, Blue Tie, Tree Stocking, Pink Turtleneck, Child's Christmas Dress, Star Ornaments, Diamond Afghan, Hoop Ornaments (Snowman, Candle, Stocking, Tree), Spot the Dog, Gold & Green Bow, Flamingo Ornament, Toy Soldiers Tree Skirt, Toy Soldiers Stocking, Cabled Jacket, Child's Dimetrodon V- Neck and matching Dimetrodon Toy, Tricia Doll, Stegosaurus Pullover and matching Stegosaurus Toy, Child's Tyorannosaurus Rex Mini Sweater and matching toy, Teddy Stocking, Cabled Set Hat - Scarf- Mittens, Woven Scarf, Bow Set Headband - Mittens - Scarf, Christmas Rose Pullover, Child's Snowflake Ensemble Legwarmers - Hat - Mittens, Stylish Cardigan, Baby Block Cardigan, Baby Seed Stitch Jacket, Toddler Polo- Collared Sweater, Crew- Neck Vest, Scarf, Knitted Collare & Cuffs; CROCHET Edging, Baby Pastel Stripes Pullover, Baby Pink Pullover, Baby Tennis V- Neck, Doll Wreath, Pearl Barrette, Floral Hair Pin, Lacy Bowl, Aran Pullover, Football, Coccer Ball, Baseball, Rose Runner, Fashion Doll Clothes (Red and Gold Pullover), Ornaments (Chocolate Bar, Twin Popscle, Single- Scoop Ice Cream Cone, Ice cream Sandwich, Ice Cream Sundae, Chocolate Chip Cookie, Sandwich Cookie, Lollipop, Double Scoop Ice Cream Cone, Key Lime Pie, Black Forest Cake), Father Christmas, Santa & Mrs. Claus, Lacy Pink Bow, Disco Stripes Hat & Scarf, Embroidered Afghan Stitch Della Robbia Afghan, Rosebud Trio Afghan - Tree Skirt - Stocking, Candy Tree Skirt, Man's Houndstooth V- Neck, Large Lacy Angel, Pineapple Angel, Cuffs and Collar, Woven Silver Bow, Check Set Hat - Scarf - Legwarmers, Toy Soldiers Afghan, Afghan Stitch Toy Soldiers Stocking, Puppets (Bear, Kitten, Lion, Squirrel, Octopus, Parrot), Elizabeth Bell, Post Shell Bell, Kristy's Bell, Florentine Bell, Oriental Bell, Cowgirl Bear, Cowboy Bear, Rocking Horse, Star Stocking, Leopard Hat & Scarf, Sampler Afghan (Sleep, My Child,and Peace attend Thee, All through the Night). Very good condition. McCall's Design Ideas Vol. 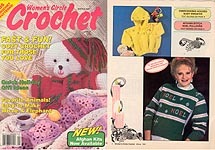 32: Christmas Knit & Crochet, McCall's, 1988. Projects include: KNIT Pastel Cardigan, Hand- or Machine Knit Poinsettia Afghan and Tree Skirt, Child's Frog Prince Pullover, Green Baby Outfit (Coat, Bonnet, Pants), Girls' Rapunzel Pullover, Girls' Princess and Pea Pullover, Fashion Doll Clothes (Peplum Ensemble Skirt & Cap, White Ruffled Dress, Camisole Dress, Boyfriend's Jacket), Botanical Cap and Gloves, Yellow Baby Dress, Tri- Colored Cable Set Scarf and Hat, Double- Knit Afghan, Jack doll, Striped Cuff Hat & Socks set, Patterned Socks & Mittens, child's Snowflake Sweater, Triple Set Check Hood - Houndstooth Socks - Triangle Mittens, Blue Baby Outfit (Coat, Bonnet, Pants), Poinsettia Stocking, Child's Reindeer sweater, Plain Socks and Mittens, Snowflake Set Hood & Mittens, Bunting & Hat, Partridge Pullover, Herringbone Scarf, Man's Snowflake Sweater, Baby's Party Dress, Gift Bag Ornaments, Pine Tree Rug, Scottish Stocking, Japanese Stocking, American Stocking, Dutch Stocking, Italian Stocking, French Stocking, Irish Stocking, Spanish Stocking; CROCHET Santa Doll, Beam Bags (Samta , Elves, Snowman, Baby Angels), Venetian Bell, Scalloped Bell, Regal Bell, Irish Rose Bell, Twinkle Bell, Ruffled Pell, Pineapple Bell, Kissing Ball, Fur Trimmed Ensemble Gloves & Hat, Gift Bag Ornaments, Poinsettia Place Mats and Coasters, Wreath Ornament, Shar-shaped Snowflake, Silver Covered Ornament, Golden Star Ornament, Angel Ornament, Lingerie Bag, Heidi Doll, Hexagon Snowflake, Creche Set (Lamb, Ox, Manger, Mary, Donkey, Joseph, Baby Jesus, Angel, Shepherds, Three Kings), Scalloped Edging, Floral silhouette Snowflake, Mistletoe Afghan - Stocking - Tree Skirt Ensemble, Nightgown Trims, Double Ruffle Edging, Pink Striped Baby Dress & Hat, Advent Wreath, Sampler Rug, Fashion Doll Clothes (Green Dress & Shawo, Pewter Evening Dress & Shawl), Rose Ornament, Snowflake Ornament, Tiny Star Ornaments, Very good condition. White Crochet Christmas, 1991. 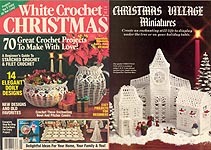 Projects include: Christmas Village Miniatures (Church and 2 Townhouses), 14 doilies, Begnner's Guide to Starched & Filet Crochet, Bowl & Pitcher covers, Snowflake Table Mat, Pine Tree Placemat, Victorian Keepsake Ornaments (Cupid, Angel, Rose Ornaments, Potpourri Ornaments, Pomander), Checkerboard & White Lace Placemats, Christmas Tre Afghan, Starry Night Runner, Bell Garland, Jiffy Candle Holders, POinsettia Basket, Snow Angel, many snowflakes and stars, Snowflake Afghan, Stockings (Aran, Striped, Christmas Delight, Gold Beaded, Mitten, Tree of Light), Frosty Hat & Mittens, Mistletoe Set, Snow WHite Pullover, White Lace Cardigan, Chirstmas Pine tablecloth, Reindeer Table mat, Filet (Holly Berry Placemat & Table Runner, Mini Candy Baskets, Peace Placemat, Filet Crochet Hearts, Frosty Mat), Tree Trims (Baby Bootie, Butterfly, Mini Wreaths, Childhood Memories, Lacy, Milk Glass Ornament, Rosette), Rose Berry Wreath, Star Tree Topper, christmas Eve Wall Hanging, Crystal Lace Stocking, Holly Berry Stocking, Red Apple Wreath, Filigree Pillow, Round Pincushion, Scalloped Edging , Shell Edging, Square Pincushioin, Granny Motif Bag, Pearl Centered Earrings, Scarf Edging, Playful Pup, Pom Pom Sweater Set, Baby's First Christmas, Magic Unicorn, Snow Bunny, White Booties, Holly Tissue Roll, Lace & Ribbon Towel Trim. Page yellowing, but otherwise good condition. 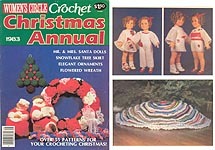 Women's Circle Crochet Christmas Annual, 1983. Projects include: , Mr. & Mrs Santa Dolls, Snowflake Tree Skirt, Flowered Wreath, Panda Ornaments, Lacy Angels, Holiday Cheer Basket, Advent Countdown Calendar, Holiday Potholders, 2 Christmas Tree Garlands, Christmas Afghan, Popcorn Star, Santa Doorknobber, Yo Yo Clown, Aligator and Dragon Hand Puppets, Berry Beautiful Ornament, Holiday Candle, Holiday Place Mat Set and Potholder, Santa Ornament, Yuletide Assortment, Elegant Ornaments, Snowman, Tiny Santa, Yule Bell Rattle, Holiday Perfumes, Ruffled Wreath, Santa Mouse, Wreath Potholder, Angel Ornament, Wreath Card Holder, Santa Boot Ornament, Santa's Helper, Wreath Doorknobber, Santa Centerpiece, Interlocking Wreath, Shirley Temple Skating Outfits (16" doll with 9" chest), Tree Skirt, 2 Christmas Tree Wall Hangings, Simple Wreath Pin, Holiday Bell and Yuletide Disc, Snowflake Tree Skirt, Basic Alphabet Chart, and more. Very good condition. Women's Circle Christmas Book 1984. Projects include: KNIT Angel Christmas Stocking, Shepherd Girl Tea Cozy; CROCHET Merry Christmas Sprites, Snowmama, Angel, Potholder, Stocking, Snowman, Button Jointed Elf, Tree Trimmings (Santa, Snowman, Medallion); CROSS- STITCH Prequilted Boots, Decorated Stockings; SEW Striped Santa Tote, Magic Wand, Calico Angel, Happy Little Donkey, Quick Indoor Frisbee, Furry Puppy, Perky Pixie, Bell Holder for Greeting Cards, Doll's Bedding Ensemble (Mattress, Sheets, Pillow, Pillowcase, & Quilt) for WOODEN Doll Crib; CRAFT Sequinned Snowflakes, Angels & Birds FrostyFelt Ornaments, Potato Print Gift Wrap, Table Ring Toss Game, Burlap and Felt Greeting Cards, Pompon Wreath & Candy Cane, Peek- A- Boo Party Invitations, Drape 'n Shape Clothespin Ornaments, Spice Bookmarks. Very good condition. 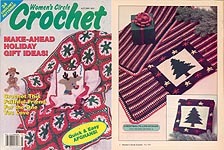 Women's Circle Crochet Christmas Annual, 1984. Projects include: A Christmaas Belle Doll (7-1/2" doll outfit), Six Splendid Stars, Ltle Angel Ornament, Tree Ornament, Toddler's Santa Mittens, A Christmas Boot, Noel Banner and Welcome Door Hanging, Granny Square Stockings, An Angelic Angel, Mr. Su Ornament, Santa Claus Ornament, ripple Christmas Tree Skirt, A Christmas Angel, outfit for 15" little girl doll, Satin Ball Pretties an Butterfly Tree Trim, Little Bell Wreath, Christmas Tree Potholder, Ruffled & Loopy Window Wreaths, Christmas Caroler dolls, crocheted Popcorn and Cranberry Garlands, Little Santa Bank, Holiday Pillows, Holiday Wreath Ornament, Rudolph Stocking and Tiny Stocking Ornaments, Lollipop Ornament, Santa Wreath, Holiday Dolls, Christmas Bell Potholder, The Frosty Family, Holiday Placemat Set, J.P. Barker, Santa Plate, Horse and Pony Ornaments, Flower Ornament, Red Headed Woodpecker Ornament Star Frame Ornament, Garden Hat Ornament. Very good condition. 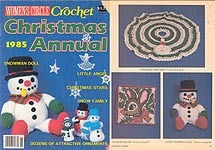 Women's Circle Crochet Christmas Annual, 1985. Projects include: Snowman Doll, LIttle Angel, Christmas Stars, Snow Family, Sweet Singing Angel, Little Lamb Ornament, Angel Tree Trim, Christmas Tree Skirt, Rudolph Pillow, Christmas Goodie Boxes, Crossed Candy Canes, Holiday Cup Warmers & Coasters & Favors, Sweet Angel Hanging, Candy Cane Ornament, Jolly Old St. Nick, Snail Ornament, Victorian Christmas Stocking, Bell Door Hanging, Wreath Tree Ornaments, Mr. & Mrs. Santa, Trio of Drums, Santa Gift Boxes, Christams Projects using Milk Jug Caps, Sleigh Ride, Cuddly Snowman, Wreath Pin, Angel Centerpiece, Boy & Girl Outfits for 15-1/2" doll, Christmas Stocking Ornament, Table Angel, Christmas Candy Cups, and more! Very good condition. Women's Circle Crochet, Autumn 1991. Make- Ahead Holiday Gift Ideas include: crocheted Collares, Festive Pullover, Rudolph Christmas Big, Teddy Bear Wall Hanging, Sweetheart Bear, Red & White Fashion Doll Dress, Baby Sweater Set, Pastel Baby Bunting, Heart of Gold Dog, Christmas Pillow/ Afghan, Poinsettia Pillow, Baker's Dozen Snowflakes, Hexagon Rug, Place Mats, and Pineapple, Snowflake, Rose- and- White, and Chain afghans. Very good condition. Women's Circle Crochet, Winter 1991 Projects include: Afghan Stitch Noel Pullover, Multicolored Crocheted Sweater, Gold- Fleck Bolero,, Large Women's Jewel Coat, Embroidered Hooded Baby Sweater, Thai Elephant, Pilot Whale, Toddler's Cardigan, Christmas Bear, Santa Purse or Pendant, Christams Tree Star, Santa and Snowman Hot Pads, White Star afghan, Triangle Afghan, Bells DOily, Little Christmas Tree Doily, Little Windows Afghan, Snowflakes, Wreath Pin, Hawaiian Angel Ornament, Little Christmas Bell, Pepper Ornament, santa's Boot Nut Cup or Ornament, Flowers and Lace Afghan, All- Seasons Basket, and Basket- Weave Edging. Page yellowing, but otherwise very good condition. Women's Circle Crochet, Autumn 1992. Projects include: Lady's Afghan Stitch Suit, Fall Pullover, Lady's Winter Cap & Scarf, Southwest Vest, Toddler's Afghan Stitch Cardigan & Cap, Joey's Indian Blanket, American Black Bear, Mama & Baby Bear, Bright & Bold Afghan, Log Cabin Area Rug, Noel Hanging, and filet crochet Heirloom Christmas Tree Skirt Cover. Page yellowing, but otherwise very good condition. Women's Household Christmas Book, 1983. A variety of crafts, including Recipes, Christmas Wreath, Mini Cheille Wreaths, TINCRAFT Angel; FABRIC Hortencia Hen, Ohio Star Pillow, Stockings for Pets, several different Clothespin Dolls, Calico Bears. Holiday Tote Bag, Curler Caddy, Mrs. Claus Ornament, Carryall, Denim Santa Boot, Gift Bags; KNIT Shawl, Mini Santa Boots, St. Lucia for 8 or 11 inch dress me dolls, Gray Mouse, Baby set (hat, booties, mittens); WOODCRAFT Alphabet Train; PAPERCRAFT Angel Placecards, Brown Bag Basket; DOUGH CLAY Mushroom Top Jars; PLASTIC CANVAS Ghost; CROCHET Santa, Snowman Fridgie, Mouse Slippers, Pac- Lady Legwarmers, Ladies Shell Vest, Christimas Tree Wreath, Snowman and Santa Doorstops, crochet & fabric hoop Framed Angel. Good used condition. 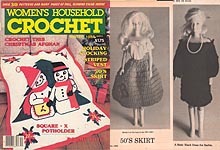 Women's Household Crochet, Winter 1984. Little Fire Chief's Helmet, Fire Fighter Christmas Ornaments, Sharing Christmas Afghan, Three Wisemen Tree Ornaments, Barbie's 50's Skirt, Crochet Tote Bag, Barbie's Basic Black Dress, Fairy Tales Can Come True: Christmas Mouse, Plain and Simple Doily, Poinsettia Tea Cozy & Place Mat, Fi let Welcome Wall Hanging, Square- X Potholder, Candle, Crocheted Striped Vest, Santa Head Ornament, Christmas Stocking, Rainbow Baby Set (Sacque, Bonnet, & Booties), Women's Rib Stitch Sweater, Butterflies Neck Roll, Wreath with Candle, Boot Bear, Bone- Shaped Pet Caddy, Beret, Armchair Organizer, Bed or Chair Holdfast, Hood, Sundress/ Formal for 4-1/2" doll, Rolled Brim Hat, Scarf & Mittens Set, Holiday Cats and Santa Lapel Pins/Fridgies, and Red Flannel Tree Ornament/ Fridgee. Good used condition. 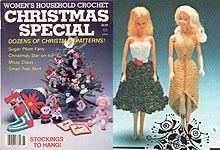 Women's Household Crochet Christmas Special, 1984. 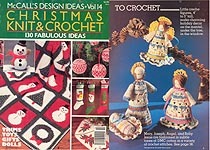 39 patterns, including: Christmas Tree, Christmas Mouse Doorknob Cover, Granny Square Stocking, Santa Claus Purse, Santa Claus Christmas Tree Skirt, Chritmas Tree Ornament, Drum ORnament, Christmas Wall Hanging, Napkin Rings and Matching Centerpiece, Christmas Tree Fridgie, Switch Plate Cover, Chimney Santa Toaster Cover, Snowflakes, Fairy Tales Can Come True: The Nutcracker, Christmas Present Tissue Box Cover, Mrs. Santa Napkin Holder, Tree Top Santa, Mrs. Claus Cookie Jar, Christmas Tree Ornaments, Christmas bottle Cap Designs, A Touch of Blue Christmas Ornaments, Sachet Ornament and Wall Hanging, Joy Pillow, Santa Boot Pin, Boot Ornament for Tree, Wreath Note Pad Holder/ Potholder, Ornament Note Pad Holder/ Potholder, Candy Cane Ornament, Christmas Bell, Snowman Ornament, Black & White Snowman, Spirit of Christmas Ornament, Simple Christmas Wreath, Santa Afghan, Christmas Caroler's Cape, Pocket Wreath, Rob Peter to Pay Paul Afghan, Rudolph the Red Nosed Reindeer Fridgie, Barbie's Christmas Formal. Very good condition. 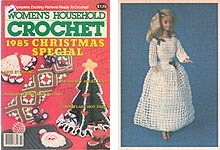 Women's Household Crochet Christmas Special, 1985. Patterns include: Adopted Kids Christmas Dress, Rudolph & Rudolph's Son Chair Set, Christmas Bells, Feliz Navidad Filet, Candy Cane Stocking with Heart Pocket, Christmas Picture Frame, Snowman Door or Window Decoration, Wall Wreath Recipe Keeper, Big and Beautiful Christmas Stocking, Baby's Jingle Bell Socks., Peppermint Christams Candy, Christmas Flower Cap, A Christmas Centerpiece, Rudolph Christmas Pillow, Christmas Trinket Box, Christmas Cup * Saucer Favors,Merry Christmas To All Sampler, Reindeer O'er the Rainbow Afghan, Christmas Centerpiece for Your Man, Christmas Slipper Centerpiece, Boy & Girl Tree Trim Alphabet Blocks, Clown Alphabet Block Tree Trim, Christmas Place Setting, Hot Rod Slippers, Hoop Photo Frame, Fireplace and Christmas Tre Wall Hangings, Christmas Party Dress with Holly Trim for 11-1/2" Doll, Fairy Tales Can Come True: O Heavenly Angel, The Christmas Princess, Mice Christmas Stocking, Advent Wreath, Christmas Tree Scarf, Lighted Candle, Holiday Centerpiece, CHristmas Tree Ornaments, Quick Poinsettia Wreath, Christmas Tree Potholder, Christmas Card Holder Wall Hanging, 12 Days of Christmas Trolls, Christmas Bell, Snowflake Hot Pads, Christmas Stocking Ornament, Christmas Bell Potholder and Fridgie, Christmas Booties, Christmas Place Mats, Red Mesh Ball Ornament, Angel Ornament, Christmas Tree Hot Pad or Table Mat, Hanging Cross, Mrs. Santa Air Freshener Cover. Very good condition. 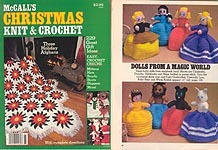 Women's Household Crochet Christmas Special, 1986. Patterns include: Christmas Bells, Christmas Beauty 7-1/2" doll, Santa and Candy Canes Spray Can Covers, Missy Claus doll, Adopted Kids outfits (Skating Outfit, stocking Cap, and Christmas Stocking), Snowman Mittens, Christmas Towel, Granny Daisy set (Mittens, Scarf, and Floppy Brim Cloche), Missy & Marty Mouse, Indian Design Cap, Old Fashioned Lamp Ornament, Snowflake Hat & Mittens, Crocheted Bed Shawl, Ornaments (Teddy Bear, Snowman, Clowns), Teddy Bear's Christmas Stocking, Christmas Bells Hot Pads, Little Angel, Sugar Plum Fairy, Small Christmas Tree Skirt, Christmas Star on Ice, Santa Claus, Snow People, Roller Skates Pin, Pixie Stocking Ornament wiht Cane, Jingle bells Flower Stocking Ornament, Square Heel Stocking Ornament, Poinsettia Granny and Frosty Pillows, Happy Holiday Placemat and Coaster Set, Glittering Christmas in White, Golden Glitter Dress and Black & White Glitter Cocktail Dress for Fashion Dolls, Christmas Candle, Santa Claus Potholder, White Poinsettia Bag, Puff Stitch Christmas Stocking, and Red , Pink, and Blue Wallflower Rings. Very good condition. Page, background, and graphics Copyright © 2005, 2012 by Hook and Web Designs. All Rights Reserved.